Recently, I was a substitute small group leader. Now, here’s the thing you need to know about being a substitute small group leader: when you sit down for the first time with a bunch of middle schoolers you barely know, you’re not going to have a very spiritual conversation. If you’ve ever met a middle schooler (or another human, for that matter), this probably isn’t news to you. Most of us aren’t exactly in the habit of pouring out our hearts to complete strangers. Here’s what I learned about the world of a few seventh grade girls. 1. I’M NOT WATCHING THE RIGHT TV SHOWS. I guess I forgot about this phenomenon in adulthood. From what I can tell, pantsing is funny to middle schoolers everywhere — past, present, and future. If you have data to support or contradict this observation, please let me know. 3. COFFEE IS WORTH SCREAMING ABOUT. Yes, there was actual screaming. If you want to win the heart of a seventh grader, start with a caffeinated beverage. 4. YOUTUBE IS THE SECRET TO STAYING COOL. I asked a seventh grader the key to staying cool when you’re old like me. Apparently, watching a lot of YouTube is the answer. So if you ever feel out of the loop on middle school culture, a few hours watching vloggers should straighten you out, I guess? 5. PRAYING OUT LOUD IS SCARY. 6. BEING IN SEVENTH GRADE IS SCARY, TOO. That’s an exact quote. 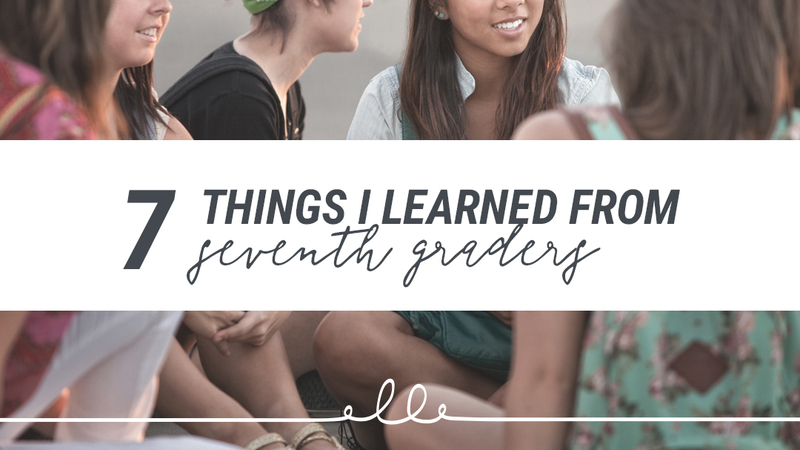 Being a seventh grader is “scary.” But can you blame them? Think about how dramatically their lives, their relationships, their brains, and their bodies are changing during the seventh grade phase. It’s a chaotic time. Nothing is stable. Their whole world is turning upside down. Last year (likely their first year in middle school) was scary, too — but this year, the stakes are higher. They’re not the little kids on campus anymore. They’re growing up. In sixth grade, it was still okay to sometimes play with dolls and LEGOs, and hang out with your mom, and not wear deodorant because you could (usually) still get away with it. But in seventh grade, middle school is in full swing. And that’s pretty scary. 7. THEY REALLY LIKE TO BE LIKED. One of the things I love most about middle schoolers — something I’m reminded of every time I hang out with them — is that it doesn’t take much to win their hearts. You don’t need to be super cool, or know the correct usage of “bet,” or have a big Instagram following. Really, you just need to like them. Which makes sense, doesn’t it?